My music collection is an absolute mess. As technology has matured, and devices multiplied my music collection has grown but it also has lost bits and pieces along the way. I grew up with varying music formats from record, to tape, to CD, and the growth of mp3 during my high school years. Now we have on-demand music services like Pandora, Spotify, Apple, Google, and Groove (Tidal doesn’t count sorry Jay-Z). These services almost compound the problem. Its great for the consumer, it means any song you want is available either streaming, digital download, or *gasp* a CD. Long on my list of tech projects is to simplify and standardize my music collection between my wife and I. There’s a greater plan out there that involves using a centralized NAS (Network Attached Storage) to act as a music server accessible from any device in my house or even remotely. The first step may be the hardest though: re-ripping CDs for quality and organizing what I do and don’t have. This also may involve repurchasing songs whose files are DRM protected (One of the most anti-consumer technologies ever made). I bet many of you are in the same boat that I am unless of course you waited for Apple and have never left their side. I’m sorry. I can still remember one of my first CDs. Green Day’s Dookie. I got it for a present along with my very own CD player in middle school. How cool! I began amassing my CD collection just like any good teenager, joining BMG and Columbia House clubs to get all these amazing cds for 0.99!!! I easily amassed quite the collection of CDS during my teen years. During this time digital music was beginning to take off. For me on my 56K AOL dialup going digital meant waiting half an hour or so for one song! Not very practical. Though I created my first Apple account around 2001 to check out iTunes (fun fact: Apple did not invent iTunes- they acquired another company which became iTunes). I did, however, start ripping songs to my PC based on my own music collection. At the time I chose 128K encoding to MP3, later trying WMA encoding at a variable bit rate as well as 128K. For those of you who dont know the higher the bitrate the better quality the music and the bigger the file size. This started to fragment my collection pretty quickly. I used Winamp to manage all my music in those days (*nostalgic tear*), so it didn’t really bother me as I managed it all in WinAmp. Once I went to college and had access to a much faster Internet pipe I started collecting music via iTunes, MSN, Rhapsody, Zune, and MTV’s URGE. Essentially wherever I got deals, discounts or gift cards. I was a poor college student. The downside to this became the DRM that was imposed upon some of these services and the siloing of file formats. The DRM was killer as some of these services (MSN, Zune, URGE, and the Rhapsody store) began to fold. Some of those files became worthless the moment you changed PCS. Sigh. When DRM began to fade consumers were free to choose whatever store they wanted to purchase music at. As it should have been all along. Amazon began offering Auto-Rip to all customers on past qualifying CD purchases. Microsoft built music purchasing directly into Windows. Google jumped in. Consumers were given choices and I have purchased from every single one of them. Now that they are in unprotected MP3 format it doesn’t matter! orip than it is to download the actual digital album. I never purchase music from Apple unless it is some stupid exclusive deal. Amazon is open, its cross platform. It just works. 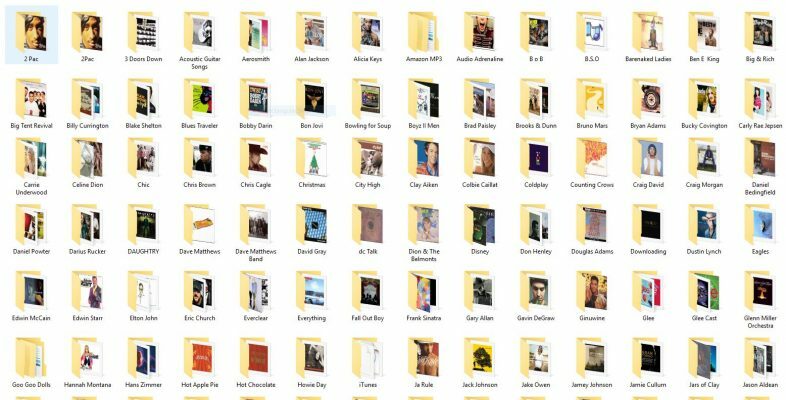 I cultivated my digital music catalog over 15 years or so, rating songs, creating playlists, creating auto-playlists based on genre and rating mostly using Zune/Windows Media Player. (The Zune software was awesome and still does more than its successors do today). My purchased music is now well over the 128K bitrate so I can tell the difference in quality when I listen to my old ripped CDs vs my newer digital downloads. The files are scattered across the hard drive from where Apple placed their music, Amazon placed theirs, and where some of the tagged artists were spelled differently depending on which service I bought the album on. Looking towards what I want my music collection to look like I have a few requirements that I would like. I want higher quality songs. This will involve probably the most work which is to go back through my original CDS and re-rip those to a higher bit-rate. I will probably do 256KB or double my existing quality. I will also standardize on the original format of MP3. MP3 is universal, I can play it in my 2007 Ford, my old Zune to my current Samsung Galaxy S7. This will eliminate all the various formats from Apple, Microsoft, and Rhapsody. I will most likely be using MusicBee to manage the ripping and cataloging of Music. I will delete the existing album and immediately rip the new improved version. My second requirement is to eliminate all DRM protected files. This should be easy to identify as protected is a file attribute for a music file. This could also be the most expensive piece and I will probably redo over time. The only way to do this is to repurchase the music. My last requirements are just the organization and folder structure itself. I want to standardize and remove any duplicates of songs from the same album, or folders where the artist name is slightly different. One example is “The Eagles” and “Eagles”. This is a big undertaking and won’t be done in just a weekend, but something that has bugged me for a long time. I want to simplify my music, strip it down, and be able to merge my collection with my wife’s. Once this is done it will be so much easier to find a song or not even care which player I am using to play it. I will be reviewing Music Apps in an upcoming post. I also want to back up my entire collection to the cloud either via Google Music or OneDrive.